As with most other cities across the country, Wilmington and the surrounding area is dealing with low inventory, high demand and steady interest rates. Good news for 2018 at least initially points toward more home construction and an increase in building permits. The new tax legislation will have a major impact on the housing market. The National Association of Realtors has stated that doing away with the mortgage interest deduction will negatively impact housing ownership, as the double standard deduction will decrease mortgage demand. “Homeowners in all 50 states would be double-taxed on the money they pay for state and local taxes." The White House has stated that the bill could boost home ownership by lowering home prices by less than 4% in some cases. 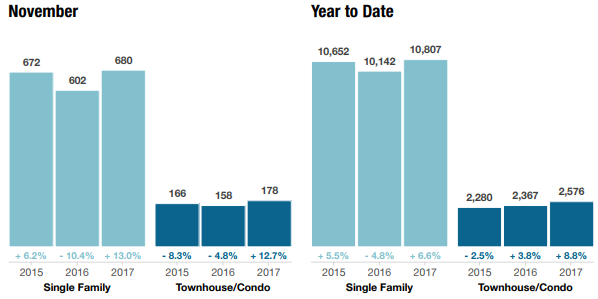 New listings are up 4% from 2016. 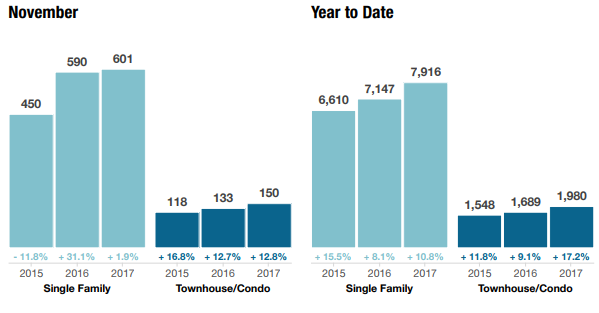 Closed sales are up 11% as well. The days on market until a sale is down 13.4% (100 days in 2016 to the current 87 days until sale in 2017). Median sales price is up 7% and is now at $215000 for the Cape Fear Area. While traditional closed sales are up 6.5% from 2016, foreclosure sales are down 23% (a drop from 43 foreclosure sales in 2016 to 33 total in 2017). 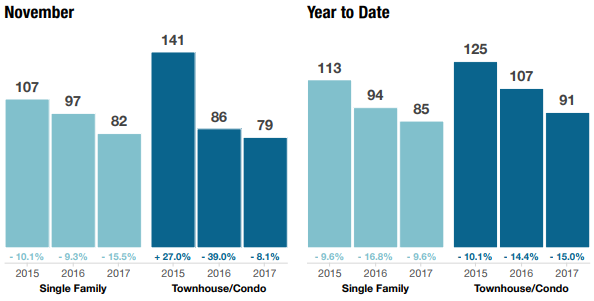 That drop is spread evenly among all property types (single-family, condos/townhomes). as could be expected, with lower inventory, days on the market has decresed from 100 in 2016 to 57 in 2017. Exactly half the homes sold are above this price and exactly half are below. The number of months it would take for all the current homes for sale on the market to sell. Foe example, if there are 100 homes on the market and 20 homes sell each month, there is a 5 month supply of homes for sale. Typically, a market that favors Sellers has less than 6 months of supply , and more than 6 months of supply favors the Buyer.